This is a quick and easy form for students to fill out at the end of a week. They have a chance to reflect then write and draw a picture about it. 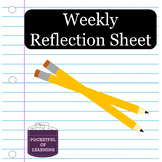 Weekly reflection sheet designed to promote metacognition in younger students of their learning, choices and behaviour. I give these to my students on every Friday. They evaluate their week. They let me know they think they've behaved, as well as how they cooperated. They can express which activities they enjoyed and those that were not their favorite. It also allows students to tell me something in confidence. Relection Sheet used by students and teachers. Student reflects on their learning and work habits. Teacher comments on students academics. I use this sheet for my students to do a quickly reflection on Friday afternoons. Their feedback helps tailor my instruction and gives me a simple way to grade their classwork in one go. Collect student data with this weekly reflection sheet and use it as evidence of student progress monitoring. I use these weekly and find it helpful in communicating with students while keeping them up dated with a weekly grade check on Friday. This is an extremely valuable resource. With a 45 minute model the daily reflection sheet does not work. Here is a weekly reflection sheet the students can use documenting what they did in each rotation. 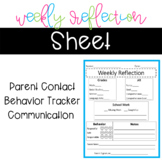 This weekly reflection sheet is perfect for sending home with your kiddos to keep their parents updated! You can use these reflections as a weekly check-in with students either in class or during morning/afternoon work time. Hope you enjoy! Please leave feedback and suggestions! Having students track their progress and make goals for themselves not only teaches life skills, but also allows them to feel a sense of ownership in their learning. This is a handout that has guiding questions for students to think about and respond to as they reflect on their week. This is a weekly calendar that is designed to help students reflect on their learning, help them define areas in which they need to develop, what areas they are successful in, and plan ways in which they can better themselves. On Mondays the sheet is passed out and an overview of the week is given. Using Whole Brain teaching rules, here is a reflection sheet where the students assess how they did during the day. A whole week is on one page for easy data collection. This sheet is great for student reflection and goal setting for any/all subject areas.